in Europe, they run on prepared grass tracks. plane, the mouth a little below the rider's hand. and incisors on which the bit rests. HAUTE ECOLE:The classical art of advanced riding. exists in too many types & breeds of horses. "Had a bad spill" or "took a spill". STALLION:An uncastrated horse over 4 years of age. with a protrusion of muscle on the underside. regular trimming of a horses hooves. COLT:An uncastrated horse under 4 years of age. HEAD SHY:A condition in which a horse is sensitive about his head. TACK:Saddle & Bridle/ TACK-UP to saddle and bridle a horse. BLEMISH:A permanent mark left by either injury or disease. CHESTNUT:The horney growths on the insides of each leg. down to the top of the gaskin. GELDING:A castrated or altered horse. BARREL:The body between the forearms and the loins. PINTO:Patches of white and any other color. HACK:A recognized type of light riding horse. CANNON BONE:The bone of the foreleg between the knee and the fetlock. AGED:A horse of seven years or more. grey fox in the absence of the red. Another term for riding horse is "SADDLE HORSE"
PIGEON TOES:A conformation fault in which the feet are turned inward. BLUE HOOF:Dense, blue-black coloring of the horn. COW HOCKS:Hocks turned inward at the point. BOSAL:A braided noseband used in western equitation. and the croup, usually occuring with old age. Also called "SWAY BACKED"
PIEBALD:English term for body color of black and white patches. BREAKING:The earliest training of a horse. The Washrack Info on horse care & health. The Indoor Arena Riding tips, information & history. 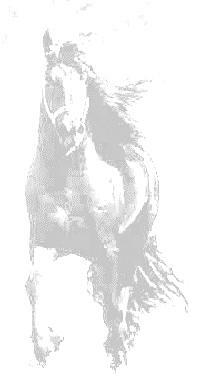 Equines of The World Tons of info on horse breeds & riding disciplines. Planet Horse An overwhelming amount of horse information and resources. Horse World Wide Links, chat, bookstores & more!!! !